Karl Richter demonstrates the origin of the expression "pulling out all the stops", as he performs Bach's great organ masterpiece at the Cathedral of St. Mary in Freiberg, Germany. Bach himself played this famous organ. Who among the heavenly beings is like the Lord? And so, the great moment for which Jonah is so well known. Jonah's not going anywhere! When he tries to get on a ship to avoid the mission that God has set out for him, God has him thrown off the ship and then provides His own form of transportation back to where he wants Jonah to be. The literal translation of the animal that swallows Jonah is a "great fish", but the incident is commonly called "Jonah and the whale", and for good reason. Whales were thought to be gigantic fish until a long time later, when marine biology became much more sophisticated and was able to classify whales as mammals. In modern taxonomic terms, we would not confuse fish and whales, but it seems silly to make a fuss over the matter about a story that occurred 3000 years ago. 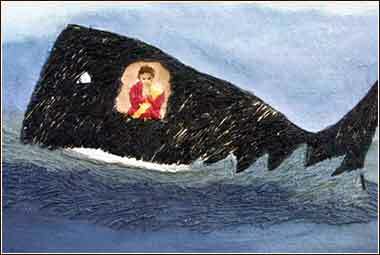 There was a modern account of a man swallowed by a whale. In 1891, it was reported that one James Bartley, a seaman about the whaler Star of the East, was lost at sea when his boat was capsized by the tail of a sperm whale. When the animal was killed and its stomach cut open, some time later, Bartley was found alive inside of it. But it would be a mistake to consider Jonah's fate a natural phenomenon at all. The very nature of God's communication with mankind is the action of an incomprehensible being, made manifest on earth in a way that can be grasped by a human mind. Perhaps God literally created a great fishlike creature who swallowed Jonah, or perhaps this is simply the only way in which the people of the time could grasp or explain what had occurred. It is entirely possible that Jonah could have been swallowed by a whale and lived in its belly for three days, for God has the power to make this happen. Or it is possible that something else actually happened, and this is the explanation given us to understand. The point is, the narrative is given to us for a purpose. If we have to suspend our disbelief in order to understand a message from God, and to grasp the meaning of the Book of Jonah, we should simply be thankful for such a colorful and memorable account of Jonah's ordeal. Untutored Alabama artist Annie Lucas was inspired to begin painting when she experienced a vision of "Jonah and the Whale" on the walls of her home. 1 John 4:17: God is love, and whoever abides in love abides in God, and God abides in him.